I have never been to prison. I’ve had my fingerprints taken a couple of times, but that’s neither here nor there. Honestly, I’m older and wiser now so I avoid activities that could get me pinched. 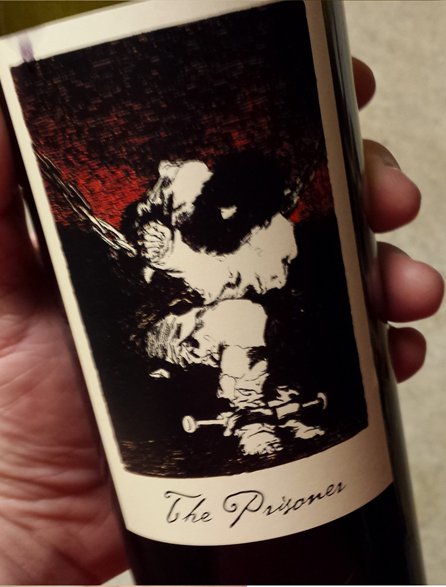 Now, the closest thing I ever want to be to iron bars is The Prisoner Red Blend from The Prisoner Wine Company. Winemaker Jen Beloz has taken the time to traverse the hills of California to meet and buy grapes from some outstanding vineyard owners. She found great producers in Calistoga, St. Helena, and Yountville that take great pride in growing some of Cali’s best. For The Prisoner, she has gathered Zinfandel, Cabernet, Syrah, Petite Sirah, and a grape you don’t hear about very much, Charbano. Also known as Bonardo in Italy where it originated, Charbano is the second most grown grape in South America, but it’s presence in the U.S. isn’t very well known. Just FYI, this grape is mostly used for blending. It adds a deep purple hue and some mid-level tannins. It’s a good grape to soften wines like Cabernet and Petite Sirah without thinning them out or detracting from the flavors they bring to a blend. The Prisoner is a fairly bold wine but overly so. I popped the cork and had half a glass straight away. I decanted the rest and let it hang out for about a half hour. The difference between my first glass and the aired out glass was obvious and wonderful. The tannins were tight and the alcohol bite was sharp until it had a chance to relax in the decanter. What emerged from my duck-shaped decanter was smooth and silky. It was one of those wines that tasted so good I forgot to figure out what the taste profile was. I just enjoyed it. A lot! Upon closer inspection, I got a whole lot of bright cherry and twangy raspberry. There were also some weird hints of dark coffee and vanilla in the background that highlighted rather than distracted from the fruit. The finish on it was kind of a cherry, pomegranate zing and the faintest air of a fresh fig. I know all of this sounds like it was a bright and shiny wine, but it was super dark red with a lot of happy character, like a prisoner who’s about to be let out on parole. He was dark and brooding on the outside, joyous and mirthful on the inside. It will set you back a few sawbucks retailing for about $40, so if you’re like me, it’s a “once in a while wine”. Nothing wrong with that. 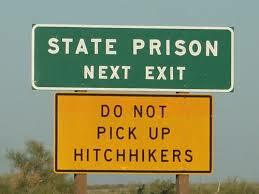 If you’re out looking for a nice bottle of vino, pick up a prisoner…I mean pick up THE Prisoner. Cheers.